Hello! Everyone, meet KAYLA. 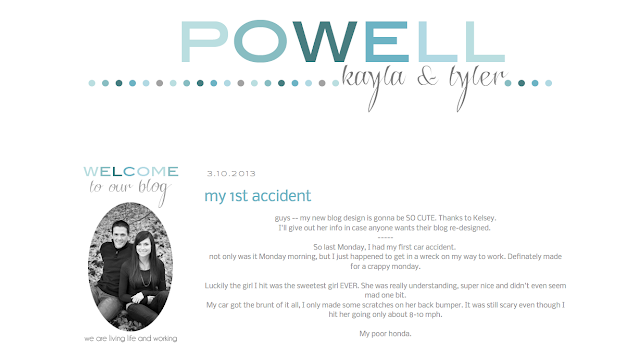 After a long 2 months and MUCH patience from her, we finally were able to get a new design up on her blog. I loved the way it turned out... simple, but perfect. Her blog is fun to read because she talks about everyday life, and to be honest, how many blogs are there that just talk about "life"? It's so refreshing to read what other people experience in their day-to-day lives, and that's what I love so much about Kayla. And can I tell you, she is the nicest person in the world! While I'm sure she was very anxious to have this little blog "face-lift" complete, my life did not correspond as easily. Seriously, HUGE thank you to Mrs. Kayla Powell for still working with me and being so kind and flexible! Head over to her little area of cyberspace and enjoy! P.S. Do you remember MarLyn, from Beard, Braids, and Baby? Well, Kayla is Marlyn's sister... in case you were wondering.